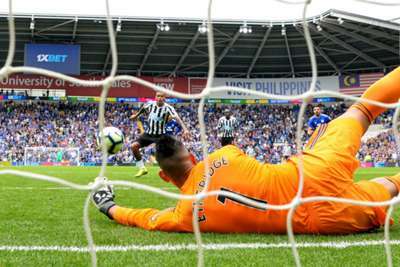 Cardiff City manager Neil Warnock felt justice was done after Newcastle United winger Kenedy had a penalty saved deep into stoppage time during Saturday's dour 0-0 draw in the Welsh capital. Kenedy escaped censure for kicking out at Bluebirds midfielder Victor Camarasa after 33 minutes of a first half in which he failed to complete a single pass. Newcastle were ultimately reduced to 10 men when substitute Isaac Hayden saw red for a clumsy lunge on Josh Murphy. But Kenedy had a chance to be the hero after Sean Morrison handled Yoshinori Muto's cross, only to shoot tamely to Neil Etheridge's left. "Sometimes you don't get what you deserve," said Warnock after his side were unable to turn second-half pressure into notable chances. "The lad Kenedy shouldn't have been on the pitch. It was a straight red. "Regarding the penalty, Morrison's hand is outside the box and his body is inside. I thought it was poetic justice." Kenedy's showing was soon the subject of widespread post-match derision, but Newcastle boss Rafael Benitez had no problem with his man stepping up to the spot after a tough outing. "It was a poor penalty, he's not happy he missed a good chance," said the Spaniard. "We win as a team and lose as a team, I am not concerned about the fact he missed a penalty, he has to take responsibility." Regarding referee Craig Pawson's respective calls on the earlier Kenedy and Hayden incidents, Benitez opted to keep his powder dry. "There are a lot of things I would like to analyse, but I do not want to talk about the referee," he added. Newcastle right-back Javier Manquillo suffered an ankle injury to prompt Hayden's introduction at right-back, but Benitez expects to be boosted by DeAndre Yedlin's return from a twisted knee for next weekend's game against Chelsea.